Swift Transportation, with 17,819 vehicles and 21,613 drivers in its fleet, is among the top five largest motor carriers in the nation. Among the ranks of UPS, FedEx, Schneider, and J.B. Hunt, Swift tractor-trailers deliver cargo all over North America. With so many drivers logging so many miles, accidents are bound to happen. Since 2012, there have been 5,350 reported crashes involving a Swift vehicle. Of those crashes, 48 occurred in Maryland. During the months of March through May 2017, 11 injuries and one death were caused by a Swift tractor-trailer accident. Why are these crash statistics so high? In part, accidents are an inevitability when a company owns such a high percentage of tractor-trailers on the road. But another reason for frequent crashes could result from Swift's hiring and training practices. Swift has a reputation as a "training company" for new drivers. Many other trucking companies will only hire experienced drivers, with a minimum of a few months of truck driving under their belts. Swift, on the other hand, will often hire new drivers directly from their driving school. The end result is injuries and death. 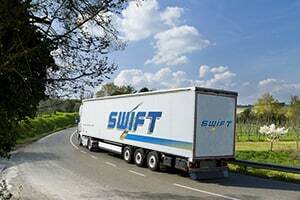 Having to make endless payouts in truck accident cases does not help Swift's profitability either. Sure, truck drivers have to start somewhere, and most reviews of Swift's training program are positive, but inexperienced drivers are logically more likely to cause accidents. We get that. But Swift also has a high rate of driver turnover; meaning that Swift not only hires brand new drivers, those new, inexperienced drivers make up a vast majority of their workforce. Since Swift offers its drivers infrequent and unreliable home time, after a few years with the company drivers tend to move on to other trucking opportunities with more favorable soft benefits. Some Swift drivers report spending only one day at home after months on the road, even after they were promised a one day minimum of home time per week. In truck accident cases, primarily concerning settlement value rather than liability disputes, the identity of the defendant should have no bearing on the outcome of the trial. In an ideal world, the jury would concentrate all of its energy on determining the correct amount of money damages that would make the victim whole again. But the reality is that the defendant makes a difference. The jury is much more likely to feel sympathetic toward a gentle-looking grandmother or a volunteer worker than they would toward a big company like Swift. And a jury's sympathy, consciously or not, tends to have an impact on jury awards. So the trial value of a personal injury claim is much more likely to be higher with a defendant like Swift, and this higher trial value leads to a greater settlement value. Additionally, because tractor-trailers are larger than passenger cars and can therefore cause more damage, Swift claims adjusters are used to dealing with big dollar amounts. This bias can also have a productive impact on settlement value. Is that fair? The deck is often stacked against accident victims. They deserve a break. What Else is Different About a Claim Against Swift? Because of the specialized data and equipment involved in tractor-trailer accident cases, not every lawyer who regularly handles car accident cases is qualified to handle a case against Swift. There are many state and federal regulations that apply to trucking accidents, as well as accident-related data storage devices that are kept onboard tractor-trailers. Commercial vehicles, such as tractor-trailers, are equipped with modern electronic instruments that record information about the vehicle's speed, airbag deployment, braking, and a host of other data points at the time of a crash. This data can help your lawyer to prove whether Swift was at fault for the crash, if they know where to look and how to use it. On our website, you can find a number of tools to help victims understand the possible range of the settlement value for their claim. Looking at variables such as statistics for the average trial or settlement value for the same type of accident, or better yet the same type of injury, may provide helpful examples. Listed below are samples of settlements and verdicts against Swift. Although claims that have a similar injury type are typically more indicative of your potential settlement value, cases involving the same defendant may give you a feel for how settlement value can vary depending on the jurisdiction, the severity of the injuries, and the economic loss caused by the injuries or death. 2015, Pennsylvania, $731,436 Verdict. A Swift tractor-trailer negligently and illegally traveled on a narrow, S-curved bridge prohibiting vehicles greater than 102 inches in length. The driver was unable to negotiate the S-curved bridge, and his trailer crossed over into the plaintiff's lane of traffic, striking the plaintiff's vehicle. As a result of the collision, the plaintiff suffered bilateral thoracic outlet syndrome with bilateral distal arm radiation, cervical sprain and strain, mechanical shoulder dysfunction and radicular symptoms in the upper right extremity. The jury found that the defendants were negligent, and awarded the plaintiff $375,000 in pain and suffering and $356,436 in past and future wages and medical expenses. 2013, California, $10,800,000 Settlement. The 61-year-old male plaintiff was a pedestrian, struck and run over by a Swift tractor-trailer as it made a right turn while the plaintiff was walking across the intersection. The plaintiff suffered a traumatic brain injury, class IV hemorrhagic shock and respiratory failure, bilateral subarachnoid hemorrhage, multiple skull fractures, multiple transverse process thoracic fractures, hemothorax and pneumothorax of the left lobe of the lung, occlusion of the right distal superficial saphenous artery, fractures of both legs, visual impairment, hearing loss, scaring, trauma-induced diabetes, MRSA, and other infections. The defendants agreed to pay $9,800,000 to settle the plaintiff's claim, with an additional $1,000,000 loss of consortium settlement for the plaintiff's spouse. 2011, Arizona, $1,100,000 Verdict. The plaintiff was sitting in the cab of his parked tractor-trailer at a Costco warehouse when a Swift tractor-trailer collided with his vehicle. The plaintiff sustained unspecified personal injuries as a result of the collision. After determining the defendants were 60 percent at fault and the plaintiff was 40 percent at fault, the jury awarded the plaintiff $1,100,000 in damages. 2008, Kansas, $23,500,000 Verdict. The driver of a Swift tractor-trailer attempted to make a U-turn into a rest area in the middle of the night, got stuck and backed into oncoming traffic, and struck the vehicle in which the plaintiffs were passengers. The plaintiffs sought damages for pain and suffering, disability and disfigurement, loss of enjoyment of life, medical expenses, and loss of earnings and earning capacity. They claimed the Swift driver was under the influence of methamphetamines at the time of the accident. The jury awarded $19,500,000 to the primary plaintiff, and $4,000,000 to his wife for loss of consortium damages. 2008, Missouri, $1,400,000 Settlement. A 65-year-old woman and her rescue dog were stopped due to traffic when the driver of a Swift tractor-trailer struck the rear of her car, drove on top of it, dragged it along the highway, crashed into three other vehicles, and then ran off the road. The woman and her dog, as well as the defendant's truck driver, died at the scene. The $1,400,000 settlement was awarded to the plaintiffs: the adult children and grandchildren of the deceased woman. 2008, Texas, $15,000,000 Settlement. The driver of a Swift tractor-trailer lost control of his rig and veered across the center median, striking the plaintiff's vehicle and killing his 9-year-old daughter and 49-year-old mother-in-law. The plaintiff's 28-year-old wife suffered serious injuries, including broken bones and a head injury. It was 4:00 am at the time of the crash, the Swift tractor-trailer driver had falsified his driver's log, and the tractor-trailer had a worn front tire and an alignment problem that caused the steering wheel to vibrate. 2007, Arizona, $32,650,238.47. A Swift tractor-trailer failed to stop at a stop sign, and subsequently collided with a suburban. The suburban driver died on impact, and his passengers, his son and nephew, sustained severe and permanent mental, emotional, and bodily injuries. The jury awarded $67,395.50 for the nephew's medical expenses and $3,500,000 for his noneconomic loss; $182,852.97 for the son's medical expenses and $1,944,000 for his noneconomic loss; $10,027,999 economic loss for the decedent's wife and $4,000 funeral and burial expenses; $1,000,000 in wrongful death claims for each of the decedent's other six children and surviving parents; and $13,875,000 for punitive/exemplary damages. The jury also returned a plaintiff verdict for the plaintiffs' noneconomic loss, but no dollar award was given. Our law firm is based in Maryland. Most of the truck collision cases we handle are in the Baltimore-Washington area, but we handle significant injury cases throughout the entire country. If you have been harmed in an accident with a Swift truck and want to consider a lawsuit or a claim for an out-of-court settlement, call one of our lawyers at 800-553-8082 or click here for a free no obligation Internet consultation.